by Major Chad M. Pillai. He is a Strategist in the U.S. Army who received his Masters in International Public Policy from the Johns Hopkins School of Advanced International Studies (SAIS). The House of Saud and the state of Saudi Arabia maintain a complex relationship with two forces that tug at the heart of the regime, Wahhabism and the support of Foreign Powers. Both forces were products of a Devil’s Bargain that gave rise to the House of Saud and which keep it a hostage to those forces threaten to undermine it. The question for the King and the ruling elite is how they balance these two forces which represent polar opposite interests. 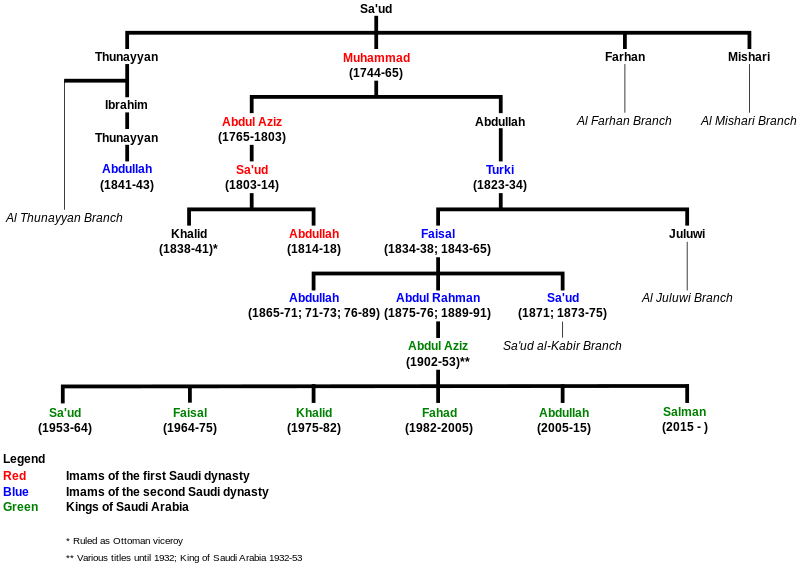 The rulers of the House of Saud (click on the image to enlarge). In the mid-1700s, a Islamic reformer by the name of Muhammad Ibn Abd Al-Wahhab who preached a strict interpretation of the Koran by insisting in the belief of one God, payment of Zakat (a form of tax), and call for Jihad (“Holy War”). He had a growing flock of followers; however, his preaching of reforms ran counter to the belief and interests of local rulers such as Uthman Ibn Muammar who expelled him under pressure from the Chiefs of Hasa. After his expulsion, Muhammed Ibn Abd Al-Wahhab moved to Diriyyah where his reputation preceded him and sought protection from Muhammad Ibn Saud. In return for his protection, Muhammad Al-Wahhab declared Muhammed Ibn Saud “Iman” of the Muslim community while Muhammad Al-Wahhab would be the spiritual-religious leader. With this agreement, a pact was signed and sealed in 1744 that signified the bond between the House of Saud and its future generations with the Wahhabi movement. With the pact between Muhammad Ibn Saud and Muhammad Ibn Abd Al-Wahhab, the first of the devil’s bargain was made by the Saud family in its pursuit to increase its power and wealth over Arabia. 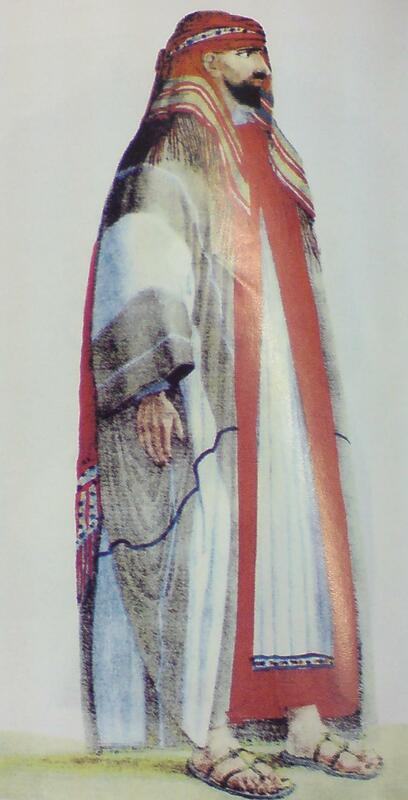 A painting of Abdullah bin Saud, convicted and executed after losing the war in September 1818. The alliance between the Saudi family and the Wahhabist allowed them to spread their power and influence through the emirate. It is unclear whether the Saudi family could have succeeded without the appeal to the people of the Wahhabist doctrine that preached the idea of purifying the land of unorthodox religious and social practices. The people were drawn to the concept of living under Shari’a law. In addition, the Wahhabi movement transcended the sedentary and nomadic tribes by the concept of Tawhid (Oneness of God) that appealed to everyone. This allowed the Saudi Family to rise in prominence. The ascent of the Wahhabist and the Saudi Family came to an end when it was force to surrender and submit to Ibrahim Pasha with his Egyptian (Ottoman) Army on September 11, 1818 (Ottoman–Wahhabi War). Less than a century later, the Saudi family made its return in its quest for supremacy for Arabia. The second movement was led by Abd Al-Aziz Ibn Abd Al-Rahman Al Saud, known as Ibn Saud. By using the religious framework of Wahhabism to consolidate his rule, Ibn Saud gained the legitimacy to rule as long as he championed the cause and became the guardian of ritualistic Islam. Ibn Saud supported the Mutawaa’a (religious specialists) and the Ikhwan (Muslim Tribal Force) within his realm to expand his conquest. In addition, he incorporated them into his expanding state apparatus by paying for them in kind which earned him submission by the population as the recognized leader of the Muslim Community. From 1902, the recapture of Riyadh, to 1932 when Ibn Saud announced the creation of the Kingdom of Saudi Arabia, Ibn Saud had utilized the Mutawaa’s and especially the Ikhwan to gain control of the land; however, Ibn Saud and his family would later regret and fight against their creation. From 1927 to 1930, the Ikhwan led by Faysal Al-Duwaysh staged a rebellion against the house of Saud. After the capture of Hijaz, the Ikhwan leaders held a conference in Artawiyyah in which they criticized Ibn Saud for his association with the British, the nature of his kingship, the legitimacy of his Islamic taxes, and his personal conduct such as his serial marriages to over 100 women. To suppress the rebellion, Ibn Saud had turned to the British, the same force that helped him expel the Ottomans. Ibn Saud attacked the Ikhwan in the battle of Sibila and on their Hujjar (village settlements) mainly in Artawiyyah and Al-Ghatghat. The British supported Ibn Saud by attacking the Ikhwan with the Royal Air Force (RAF) which caused many to flee to Kuwait. The British fearing the Ikhwan’s destabilizing factor in Kuwait, fought them until the Ikhwan surrendered in Kuwait in 1930. In addition to defeating the Ikhwan militarily, he also scored a religious victory when the Ulama (religious scholars) and Mutawwa’a clarified its ruling concerning the relationship between the Ra’i (Shepard/leader) and the Ra’iyya (Followers) and the obligations to one another. As a result, Ibn Saud invoked the Wahhabi concept of submission to the leader of the Muslim community to seal his legitimacy and supremacy. While the Ikhwan rebellion may have been defeated in 1930, it would make a revival again in different manifestations to challenge the authority of the House of Saud such as the Siege of Mecca in 1979 and the emergence of Al-Qaeda. 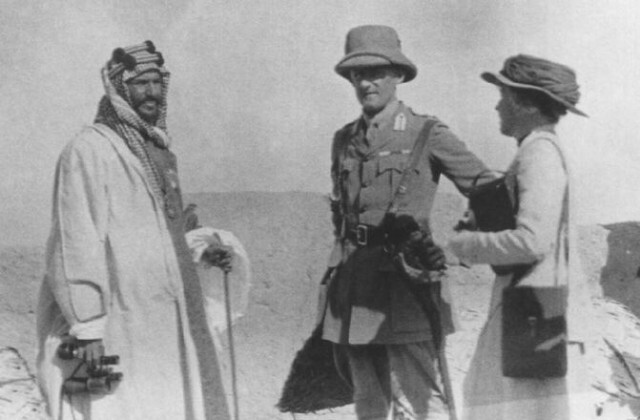 In 1916, three years after Ibn Saud won control of the Arabian Gulf coast, he met with British political officers Sir Percy Cox and Gertrude Bell to strengthen the Saudi-British ties that had been formalized by the Anglo-Treaty the year before (Photo contibuted by Saudi Aramco). On November 20, 1979, Juhayman Ibn Muhammad Al-Otaybi and Muhammad Ibn Abdullah Al-Qahtani with their supporters seized the Mosque in Mecca in order to challenge the authority and supremacy of the House of Saud. As had been the case with the Ikhwan rebellion, Juhayman and Al-Qahtani attacked the House of Saud for its relationship with “Infidel Powers”, its lavish lifestyle, and relationship between the Ulama and the ruling family. An example of the House of Saud creating something it later would regret is its support for many of Juhayman’s followers who were students at the Islamic University of Medina where the Egyptian Brotherhood had a considerable influence. The Egyptian Brotherhood would spread their influence throughout many Saudi Universities and lay the foundation between the Egyptian Brotherhood and Al Qaeda’s spiritual leader Osama Bin Laden. Similar to the Ikhwan Rebellion, the House of Saud relied on the religious scholars to denounce the Juhayman’s and Al-Qahtanni’s siege of the Mosque in Mecca that allowed for military intervention within the holy site which defeated the rebels in December 1979. The rebel’s mistake which the House of Saud capitalized on was the naming of Al-Qahtanni as the Mahdi (the one who guides) which was a controversial move in Sunni Islam. The siege of 1979 in Mecca was not the only major event to challenge the House of Saud. That same year, the Soviet Union launched an invasion of Afghanistan to support the Afghan Marxist Government. Besides the threat of a domestic Ikhwan challenge to the ruling Saudi family, the biggest threat came from the global communist movement which was presented as a social, political, and religious challenge to Islam. In order to counter the Soviet threat, the Saudis provided money to the mujahidin resistance fighters and allowed Saudi citizens to go and fight as volunteers. The Saudis would support the mujahidin until the Soviet Union retreated from Afghanistan in 1988; however, due to their support of the mujahidin, they had unwittingly created another monster that would come to haunt them. The training these Afghan-Saudi volunteers had received predisposed them towards a fundamentalist Islamic ideology which turned their attention back towards the House of Saud and challenged the legitimacy of its authority to rule. The Iraqi Invasion of Kuwait in 1990 would give ammunition to these Afghan-Saudis, led by Osama Bin laden, as a result of the King’s decision to allow “Infidel armies” to fight in the land of the holy places in order to defeat another Muslim army (Iraq). The invitation to the Americans, British, and other Western forces “shattered the myth of Saudi non-alignment, Islamic Politics, and self-reliance” (Madawi Al-Rasheed, “A History of Saudi Arabia“, Cambridge University Press, 2006, p. 162). This decision gave rise to Osama Bin Laden who had already made a name for himself in the Soviet-Afghan War and had established Al-Qaeda to fight Jihad against unbelievers. Osama Bin Laden had attended King Abdulaziz University in Saudi Arabia and had been influenced by Abdullah Azzam, a Palestinian who Bin Laden later had killed, and from his association with the Egyptian Brotherhood (Egyptian Islamic Jihad) and Islamic Group who were spiritually led by the “Blind Sheikh”, Omar Abdel Rahman, who the US would later implicate in the 1993 World Trade Center Bombings. The association of the rebels of the 1979 Siege of Mecca to the Egyptian Brotherhood would come full circle when Egyptian Surgeon, Ayman al-Zawahiri, would join his faction of the Egyptian Islamic Jihad with Osama Bin Laden’s Al Qaeda to fight the “Infidel forces” in the Middle East and to challenge the authority of the House of Saud. In order to understand the challenge that the Ikhwan, the 1979 rebels, and Al Qaeda represented to the House of Saud, one must understand the other Bargain the House of Saud made with the Devil; its relationship with the “Infidels” in order to come into and maintain power. Map of ground operations of Operation Desert Storm from February 24-28th 1991. Ibn Saud utilized the Wahhabi movement to acquire political and religious legitimacy, but it was the military and financial muscle of foreign “Infidel powers” of Britain and the United States that ensured his hold on power. Ibn Saud’s relationship and alliance with Britain proved crucial in the early 20th century as he fought against his rivals the Rashidis and the Sharifians (Hashemites) who were aligned with the declining Ottoman Empire. Upon the outbreak of World War I, the British turned to Ibn Saud as an ally to undermine the Ottoman Empire which was supporting the German and Austria-Hungarian Empires. In 1915, Ibn Saud signed the Anglo-Saudi Treaty which resulted in Britain recognizing Ibn Saud’s claim to the Najd, Hasa, Qatif, Jubayl and other territories ruled by Ibn Saud while promising military aid if they were attacked by outside powers. In return, Ibn Saud agreed to recognize the British domains of Kuwait, Bahrain, Qatar, and Oman. After the defeat of the Ottoman Empire, the relationship with Britain continued, but had fractures due to Britain’s support of the Sharifian family which established the Hashemite Kingdoms of Trans-Jordan and Iraq. It was this relationship with Britain and the establishment of the Hashemite Kingdoms which limited Ibn Saud’s conquest of the Arabs that would later lead to the Ikhwan Rebellion. As a result of Britain’s relationship with Ibn Saud and the British northern dominions of Trans-Jordan and Iraq, the British and Ibn Saud signed the Treaty of Jeddah in 1927 thereby recognizing the absolute independence of Ibn Saud as the leader, but not the Saudi State. That slight omission in the treaty would ensure British interference in the affairs of the Saudi State. The British suspension of funding for Ibn Saud after his campaign in Asir would eventually lead to the British being replaced by the Americans as the key strategic partner. Due to Ibn Saud’s debts as a result of his campaigns to unify Arabia and defeat the Ikhwan Rebellion, Ibn Saud’s Finance Minister Abdullah Ibn Sulayman signed an agreement with American Standard Oil Company of California (SOCAL; today Chevron) which was the predecessor to Aramco. To justify this agreement, Ibn Saud cited the Sura Al-Kafirun which allowed for the possibility of separation/co-operation between Muslims and Non-Muslims thereby provided the religious cover for the Americans to come to Arabia to search for oil. Ibn Saud’s concession to the Americans came at a time Saudi Arabia was experiencing several financial turmoil which could have undermined the Saudi Regime. Aramco pioneers Tom C. Barger, geologist and later CEO of Aramco, and Khamis ibn Rimthan, legendary Bedouin guide, and other field party members in’Ain al-Tarfa, Eastern Province, February 1938. The final blow to the British was their lack of support for Ibn Saud’s campaign against Yemen which Britain did not see as a strategic interest like Iraq. As a result, Ibn Saud aligned with the Americans who were considered neutral and at the time without obvious imperial ambitions. After World War II a weakened British Empire, which continued its support for the Hashemite Kingdoms that represented a challenge to Saudi Arabia, was replaced by the Americans as the foreign power most involved in Saudi Affairs. As a result, Aramco became the institution that helped Saudi Arabia modernize its infrastructure and the tool in which the Saudi regime solidified its power. The relationship with the Americans was strained in 1973 after the start of the Arab-Israeli Conflict (Yom Kippur War). Initially, Saudi Arabia stated that it would not use oil as a weapon; however, King Faysal eventually made a statement that he could not support countries that were helping the Israelis and thereby agreed to the OPEC embargo. This move helped Saudi Arabia eclipse Egypt in the region that was losing to the Israelis; however, this move put it in direct conflict with the US which hinted at threats of invasion to secure its energy security. This caused Saudi Arab to threaten to destroy its oil fields in retaliation for an invasion (a threat made by Al Qaeda today to cause an economic collapse for the US; cf. : Khalid R. Al-Rohan, “The Impact of the Abqaiq Attack on Saudi Energy Security“, Center for Strategic and International Studies (CSIS), 27.02.2006). The Saudi’s backed down after the US threatened an embargo of grains to Saudi Arabia and other Gulf Regimes. After the end of the Oil Embargo, Saudi Arabia moved closer to the US as a result of its perceived vulnerabilities which ensured low oil prices for the US and Europe while the US provided security. This vulnerability would be exposed in 1990 when the Saudis invited the US for protection against the Iraqis despite its immense wealth and spending on military hardware. It was this contradiction that gave Osama Bin Laden the material he needed to attack the Saudi Regime for being corrupt. The 1990/91 Gulf War proved a shock for the Saudi people. They had been aware of the Saudi-US relationship, but were not prepared for half a million US and Western Soldiers, especially women, on their lands. While some supported this, a minority saw this as a violation of Islamic Principles. This caused some to argue that the involvement of non-Muslims to fight Muslims demonstrated the illegitimacy of the Saudi Royal Family. This claim grew stronger after the defeat of Iraq in Kuwait that left thousands of Americans on Saudi soil to continue their no-fly zone military operations against Iraq until the start of the second Gulf War in 2003. As a result, domestic dissent grew against the Saudi state which saw a series of attacks against US targets around the world and in Saudi Arabia (Khobar Towers 1996). This would eventually boil over into the attacks of 9/11 and Al Qaeda’s operations inside Saudi Arabia in 2003 in their attempt to bring down the Royal Family. The Attacks on September 11, 2001 was Osama’s Bin Laden’s quest to attack the US and draw it into a war in the Middle East against Muslims. In addition, his goal was to draw the corrupt Islamic Regimes into the conflict and cause their downfall, especially the Saudi Royal Family. It is ironic that it was September 11, 1818 that brought down the first Saud regime by a foreign power (Ottomans). Is it possible that Osama Bin Laden chose 9/11 as a symbolic date to signify the fall of the third Saud regime? The attacks brought an angry glare from the US against Saudi Arabia after 15 of the hijackers identified were from Saudi Arabia. Had the devil come to claim his due by having both the Wahhabi and the Foreigners turn on the House of Saud? Saudi Arabia had become the problematic ally for the US as the regime was locked in a mortal struggle with Al Qaeda, but a population that supported and gave rise to it. Al Qaeda, Saudi Arabia’s third creation during the Soviet-Afghan War had come back to haunt it. As in the Ikhwan Rebellion, the Saudi Royal Family turned to its foreign patrons for support to defeat Al Qaeda militarily and to its support from the Ulama to discredit Osama Bin Laden. Today and in the near future, Saudi Arabia faces another offshoot of its support for extremist groups – the Islamic State which seeks to re-establish the Caliphate. Distribution of Shia and Sunni Muslims across the Middle East (by Dr. Izady / Gulf/2000). The wars in Afghanistan, Iraq, and today in Syria created other problems for Saudi Arabia by the unintended consequence of these wars empowering Iran, the historical regional hegemon and enemy of the Arabs. As Robert Baer claims, the failure of the Sunni Order in defeating Israel, its ties to the “Infidel West”, and creation of Sunni extremist makes Iran the likely successor for the soul of Islam (Robert Baer, “The Devil We Know: Dealing With the New Iranian Superpower“, Crown Publishers, 2008, p. 198f). As King Abdullah II of Jordan claims, a Shia Crescent is rising from Persia to Lebanon. The recent collapse of Yemen to Iranian sponsored Houthi Shi’a rebels adds further credence to the fear of rising Shi’a Crescent which had led Saudi Arabia to lead a Sunni Arab coalition to defeat the Houthis and roll back Iran’s influence. While the fear of a Shi’a Crescent may be debatable, the truth of the matter is that it is likely and only Saudi Arabia’s internal reform can prevent it from losing its title as defender of the two holy places. If it was a Shia-led Iraq that had a special relationship with Iran, and you look at that relationship with Syria and with Hezbollah-Lebanon, then we have this new crescent that appears that would be very destabilising for the Gulf countries and actually for the whole region. — King Abdullah II of Jordan, Hardball with Chris Matthews, NBC News, 09.12.2004. In order for Saudi Royal Family to retain their power, they must not only balance the two forces of Wahhabism and the Foreigners as part of their Devil’s Bargain, but they must also provide hope for their people. The new generation of Saudis will redefine the political and religious landscape while confronting the realities of globalization. The regime will have to inspire and lead the pragmatists who have interacted with the outside world and see the need for reform, but also see the limits and the need to preserve their unique culture (Mani Yamani, “Changed Identities: The Challenges of the New Generation in Saudi Arabia“, Brookings Institute Press, 2000, p. 1). The House of Saud can continue balancing the gift the Devil gave it or it can cast aside that old bargain and seek a new bargain of its own choosing. What it might just need is a Saudi led Islamic Reformation to challenge the old Wahhabi 7th century philosophy and recast Islam for the 21st Century. • Madawi Al-Rasheed, “A History of Saudi Arabia“, Cambridge University Press, 2006. • “The 9/11 Commission Report“, August 2004. This entry was posted in Chad M. Pillai, English, Saudi Arabia, Security Policy. Great write up Chad. Oh, and FIRST TANK!